Recently I feel like I’ve been seeing eight ball zucchini everywhere! I guess that could be explained by the fact that they’re in season right now…but still. 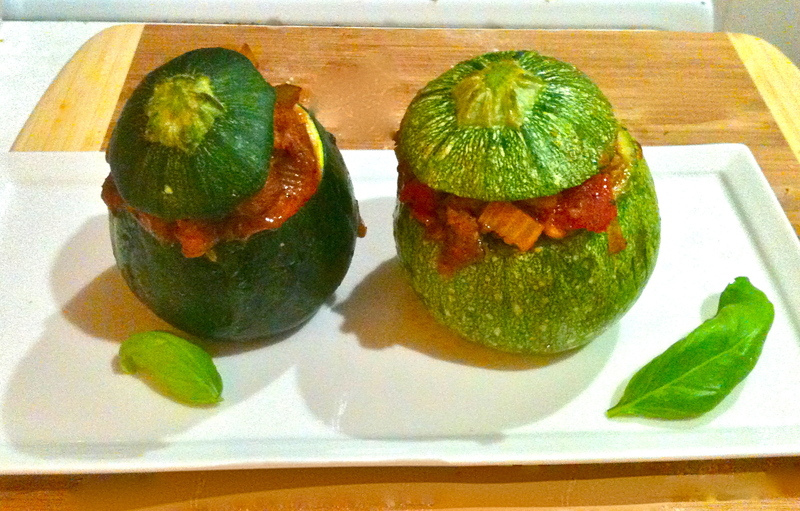 I noticed that a bunch of bloggers had interesting stuffed zucchini recipes to offer; then these pudgy little guys appeared on my roommate’s dad’s wedding menu 2 weeks ago, and (as if it weren’t a sign from the universe that I should give them a try myself), they were at my farmers market on Saturday. So I picked up a few. First of all, they’re adorable. Second, they’re so versatile! I love how they leave so much room for food-creativity. I just kind of made this dish up as I went along, and you can can do the same–just prepare them using whatever you’ve got hanging around your kitchen and these will come out beautifully! Heat a pan over medium high and add a splash of oil. When the oil is hot, add the chorizo. Cook until browned on the outside. It’s okay if it’s a bit pink in the middle, because it’s going in the oven in a bit. Set the chorizo aside. 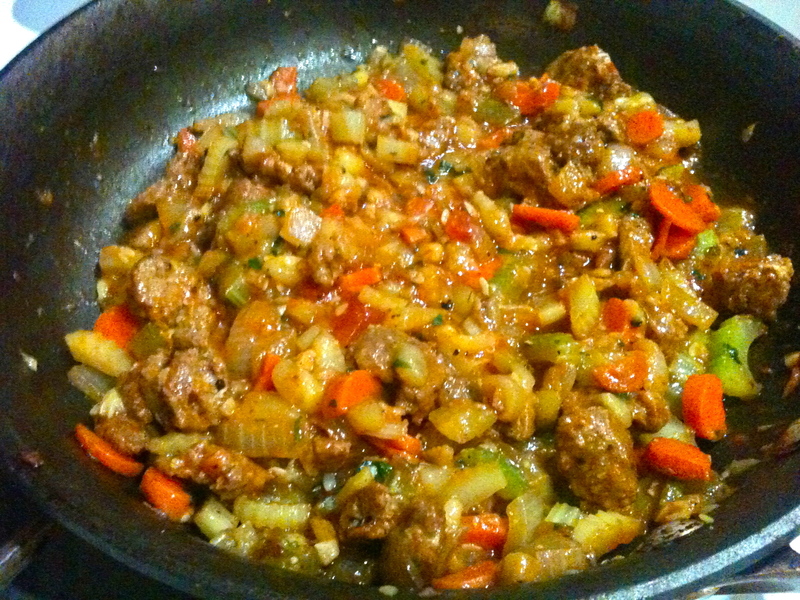 Add the celery, carrot, and onion to the pan with the chorizo juices and cook until soft. 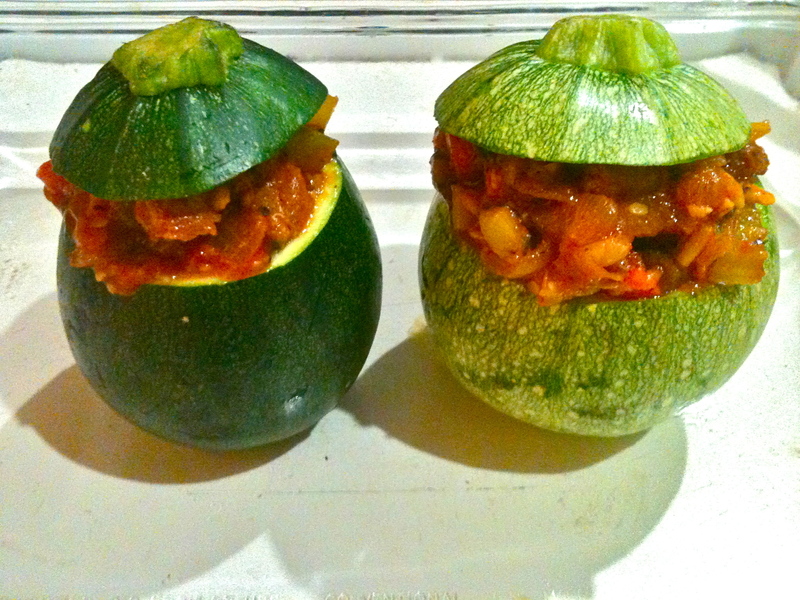 While the veggies cook, cut the tops off your zucchini and set them aside for later, and hollow them out. I used a mellon baller. Roughly chop the insides and set them aside. Stir in the garlic and cook 1 minute. 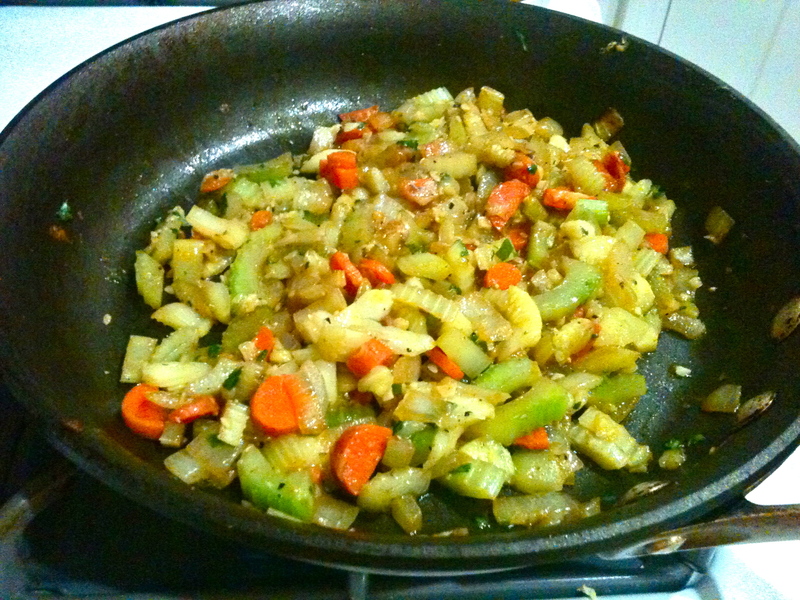 Then add about 2/3 of the zucchini insides, salt and pepper to taste, and stir. Cook down the mixture until it shrinks a bit, letting the zucchini liquid cook off. When the mixture has tightened up a bit and some of the liquid has cooked off, stir in the basil, tomato sauce, and the chorizo, and give it another 3 minutes or so. Then remove from heat and let cool 10 minutes. 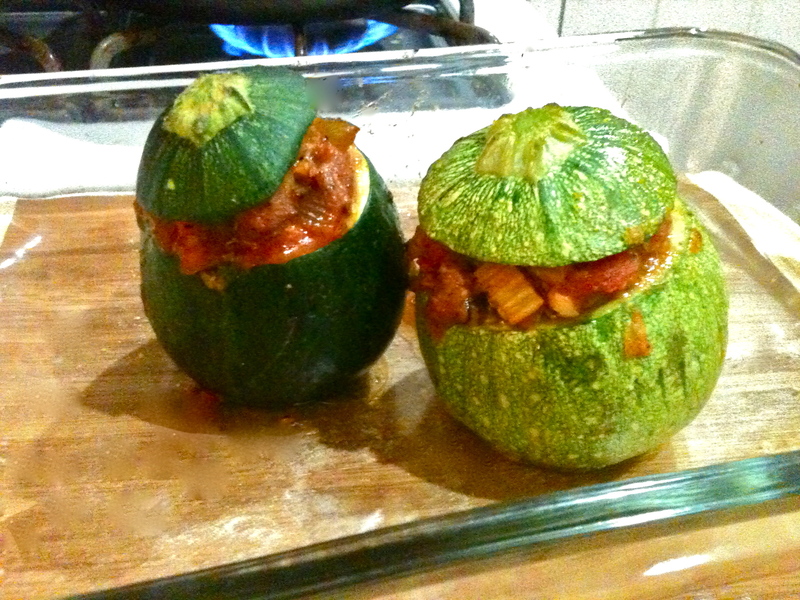 When the mixture has cooled a bit, stuff the zucchinis. Place them in a casserole dish or other oven-safe pan and put their little tophats on. Cover the pan with a sheet of foil and bake for 15 minutes. Then remove the foil and finish them off for another 15-20 minutes, until soft and tender. That’s it! Take them out and enjoy. I buttered a piece of easy French bread and toasted it in a pan, and it was the perfect simple accompaniment. Previous Potato and Lentil Curry. Next Balsamic Watermelon with Goat Cheese and Basil. I’ve never seen eight ball zucchini! They are so cute and yummy :) It was such a nice surprise to find them at my market, I’d never seen them before!